Abdullah described her experience to Cate Blanchett. “Get your bag, we are going." Those were the words Aya Abdullah heard from her father in 2009 as the family fled war and their life changed forever. 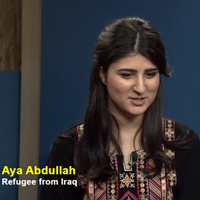 Abdullah, a student at Webster University's Geneva campus, said she didn't understand what was happening, nor where they were going, but she soon came to understand the life of a refugee since she has now experienced it twice, first from Iraq and then again from Syria in 2011. She described her experience this week in a Facebook Live interview with United Nations High Commissioner for Refugees (UNHCR) Goodwill Ambassador Cate Blanchett during the World Economic Forum in Davos, Switzerland. Abdullah's family left Syria for Turkey, followed by a long journey to Switzerland, where she studies at Webster. Abdullah said the journey made her stronger as she worked as a refugee, for other refugees. Watch the full Facebook Live video here as Abdullah and JJ Bola, from the Democratic Republic of Congo, shared their stories. "We can show our communities that we lost our friends, our relatives, schools, homes, but we didn’t lose our brain. We can build a life again.”"